Ottobock, this weeks company in the #cl2025 Moocathon (see https://colearn.de), asks people to think about their own learning strategies. In this context, PKM came up very quickly. As some people where wondering what PKM means, I decided to post this text of mine, which originally was an assignment in a MOOC, asking for examples of Collaborative Intelligence. At first sight, it does not seem that Personal Knowledge Management has a lot to do with Collaborative intelligence or Social learning. But actually, it has a lot to do with it! Personal Knowledge Management (PKM) is a way of personal learning and advancing in a highly connected world. Harold Jarche, one of the leaders of PKM, sums it up as SEEK, SENSE, SHARE. Seek for good, valuable sources. This does not mean static sources as e.g. text books, but humans- leaders and experts in the field your interested in. They may publish blogs, newsletters, articles in magazines, or Tweets you can read and learn from. They are the sources of collaborative intelligence you can reach for and use. Sense what you learned. Just reading something does not have the same level of impact than trying to make sense of it by putting it into your context, your problem, your expertise. Reflect on what you read and draw your own conclusions. Share your thoughts with others. Publish what you reflected on or what conclusions you draw. This can be done by commenting on other peoples blog posts or articles (and not just “well done”!) or by publishing your own thoughts in posts or articles, referencing your sources or inspirations. By doing so, you do your part in Social Learning, you give something back to the community you learned from and you contribute to the Collaborative Intelligence. One point is to find the right sources. Normally you already stumble upon quiet some sources just by searching the Internet. It is valuable to find sources that deliver continuously interesting content. This may require some time and effort. The other point is to find the right medium. Maybe you like blogs and therefore a RSS feed reader. Or you like Facebook. Or you like (like me) Twitter. Twitter for me is the most valuable tool for PKM. By following people and reading their re-tweets, you find other valuable people in the field and can expand your network. By reading articles or blog posts they wrote (and tweeted), you learn new stuff. And by reading articles or blog posts of other people they liked and therefore tweeted, you get to content already reviewed. In addition, it is a medium that can be easily used in short time- while waiting for the bus or pick up your kids at school. 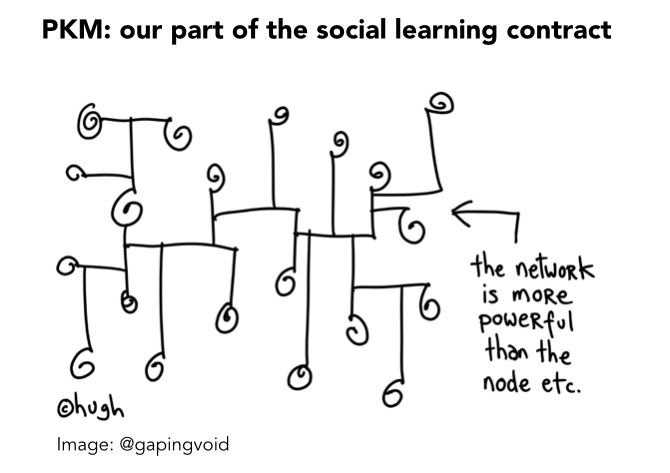 Another plus for twitter is the immediate feedback you’re getting, which leads to a unique collaborative learning dynamics with a sense of community (also through the network building aspect of PKM in general) and motivation to contribute by sharing and reviewing. Harold Jarche has several workshop he offers where one can learn how to build up an own PKM strategy. Another valuable person to follow is Jane Hart. She is the Queen of social learning at the workpace (and highly interacting with Harold Jarche) and also yearly publishes a huge survey about Tools for Learning. On Twitter you can find them here and here, and me you can find as mcschlatter.